Heading for the Black Hills of South Dakota in early June, 2013, just before dusk, in a cold rain storm that intermittently switched to snow, I dozed behind the wheel and tried to stay awake. I was an hour or two out from Hot Springs, South Dakota, my destination for the night, and in this part of the world, lodging options are few and far between. I drowsily pushed onward, rumbling down Highway 85. The bluffs surrounding the road stood out above the dense fog that hugged the old highway. In one spot, as I looked out the passenger’s window of my car, I saw a sight that I will never forget- A herd of buffalo, on the stampede across the prairie, surrounded by fog. Old buffalo, buffalo calves…tromping at full speed through fog and rain. It was truly one of the most amazing things I’ve ever witnessed, and with exception of the headlights of my car, this scene and moment could’ve (and had) taken place in this part of the world for thousands of years. I won’t lie, it brought tears to my eyes…I guess because I’m a sappy, sentimental sort and I’ve always felt I was born 200 years too late. Shortly after my chance encounter in the fog with the charging buffalo, I saw a sign that said “Historic Jay Em, Wyoming” with an arrow pointing left of the main road. I had to make it to Hot Springs that night, so I decided to stop on my way back home a few days later. I’d never heard of “Jay Em” before, but apparently it was named after a rich local rancher who funded its building around the turn of the last century- his initials were J.M. It was laid out as a stopping and supply point for travelers and ranchers heading to or from the Black Hills region in the early 1900’s. 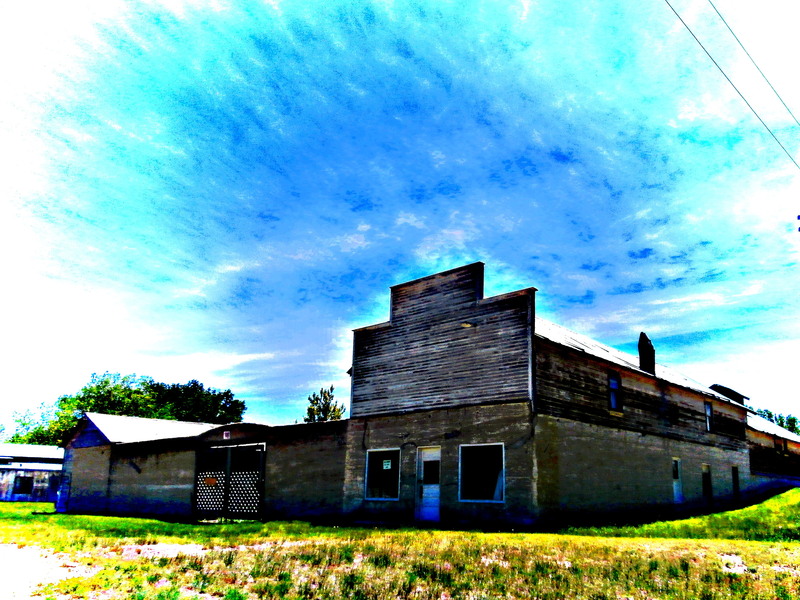 It never materialized due to it’s proximity to Lusk, Wyoming, and rapidly faded. By 1920 the grand plans for “Jay Em” had been forgotten, and the town faded. 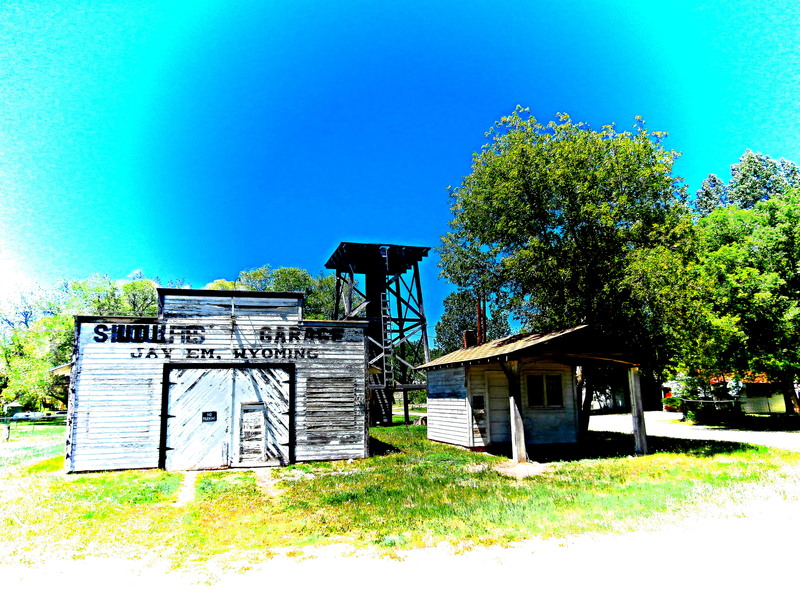 Today, Jay Em, Wyoming still has a few residents, and a Post Office that serves the local ranchers. No other businesses (as far as I could tell) call Jay Em home. The old business district of Jay Em is well worth the stop. The buildings have been maintained by the few remaining locals, and you’ll more than likely be the only one there to enjoy the sights and take photos. 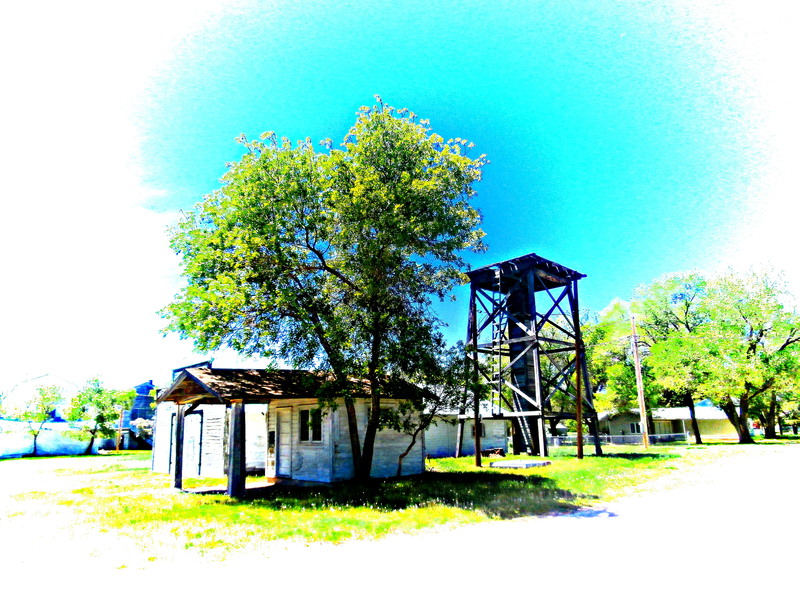 An old lumber mill, a machine shop, a mercantile, an old garage and water tower, all painted white are an interesting step back in time. Jay Em never had a paved street, and around the “business district” several old homes dating to Jay Em’s prime still stand. Several newer houses dot the surrounding area, and like most ghost towns or almost ghosts of the west, a watchful local will always peer out a window or come out and stand by their fence and stare until you leave. 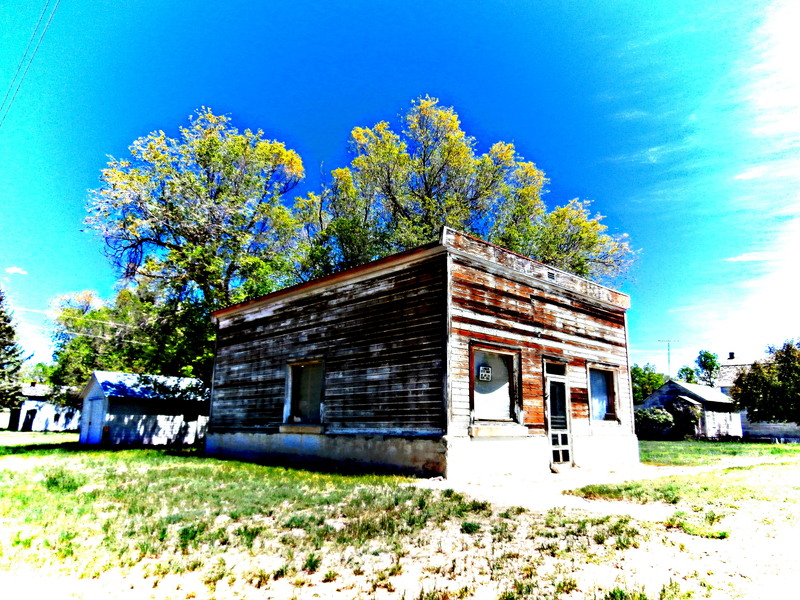 I started the first grade in Jay Em, Wyoming in 1954. My mom, younger sister, and I moved there from Lusk when she married Art Mayfield, who worked for a local rancher. We lived in the house across from the church, which at the time was just being built. Next to the house was a park with a small stream which ran through it. The businesses were still operating at that time. We attended church In the top of one building , and they also showed movies there. We only lived there about 6 months, as the marriage didn’t last, and we moved on to Colorado…but I still have fond memories of that time…my mom painted the floor and painted herself into a corner….one evening 2 men came to the door, claiming to have car trouble on the highway..they said they could see our lights from the highway and wanted to use our phone…mama said we didn’t have one, and they left…but she later found a $100.00 bill laying on the table by the door. 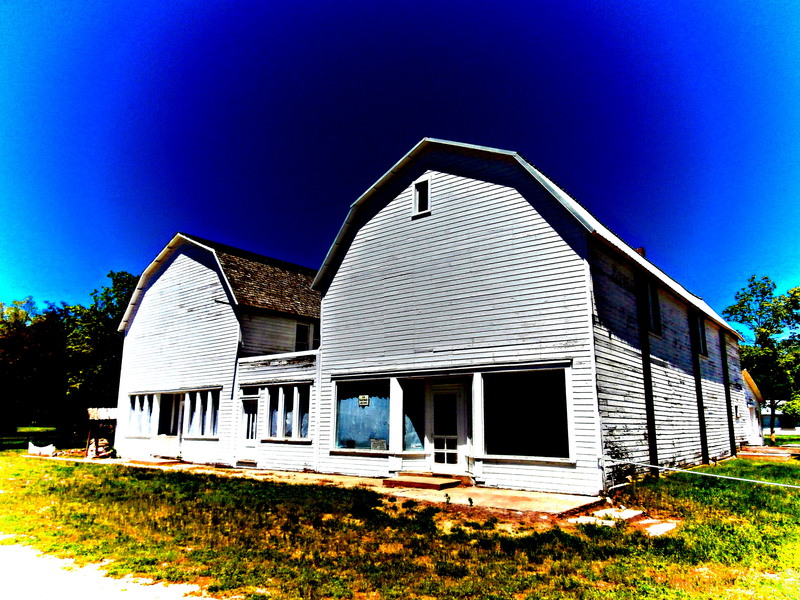 We were very poor and she always claimed they were visiting Angels…It was always my “dream” to own Jay Em and turn it into a tourist attraction like the Flying J Ranch in Colorado Springs. There are so many interesting artifacts left there in the stores. For my granddaughter’s Senior trip, I took her there and we were able to see into the stores….but the last time I was there The windows were covered over…Just good memories now…..